CORKY HALE–UNCORKED! is the extraordinary life story of the inimitable, irrepressible jazz harpist/pianist/vocalist, pioneering social activist, and philanthropist. 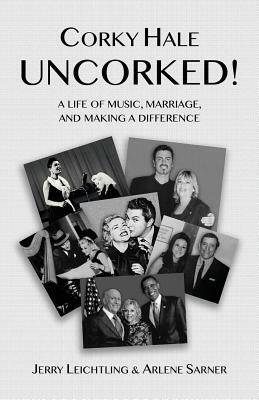 Corky has worked with and befriended superstars of every generation, including Frank Sinatra, Barbra Streisand, Billie Holliday, Tony Bennett, Liberace, Bjørk, and George Michael, as well as her husband of almost 50 years, Mike Stoller, of the legendary songwriting/producing team, Leiber & Stoller. She is passionately involved in progressive politics, and counts former Speaker of the House Nancy Pelosi, former Lt. Governor of California Gavin Newsom, and Los Angeles Mayor Eric Garcetti among her friends and colleagues. At last, Corky shares her unique American success story with the no-holds-barred candor that is her trademark, treating the reader to a complex portrait of a multi-talented woman with more than her share of vitality, tenacity, and artistry. CORKY HALE–UNCORKED! is a timeless and timely tale of a remarkable woman whose life, through great music and an admirable marriage, is dedicated to making a difference in the world.